Hello and welcome to the third, and final, instalment of the The VanCan ScranVan Diaries, a short experiment in food writing where the words meat, filled and pastries have been in short supply. I’m writing this final instalment in the bowels of the maze that is Heathrow Airport as I wait for my connecting flight home. If I hadn’t been on my holidays this could have turned into a far grander project but as it is it’s been nice to test the waters with something a little bit different. Today’s review comes from The Roaming Dragon. As I’ve mentioned before Vancouver has a ‘booming’ food truck scene and my final review could have come from any number of places, there was Tacofino, which sold, well tacos obviously which many people had raved about and the ever elusive ‘Yolks Breakfast Company’ who I swear were never at the location they claimed to be each time I tried to visit. Eventually though, on my flinal morning, I plumped for The Roaming Dragon. So with the intro done, let’s have some Van Scran fun! Where: Corner of Robson St. and Burrard St. I had been curious to see just how the Asian influence, that was clearly prevalent throughout the city would translate to the food truck scene especially after two stonkingly good Asian inspired meals in a day (A Dim Sum brunch which included my first taste of BBQ chicken’s feet and a multi-plate Chinese sharer that opened my eyes to a whole new world of vegetarian cookery). Initially I had been drawn in by their online promise of Korean BBQ Tacos however I was more than a little disappointed to see that they were not on the menu come my arrival. Where’s my Korean BBQ Taco’s? However never being one to turn down a good scran I scanned the available options. 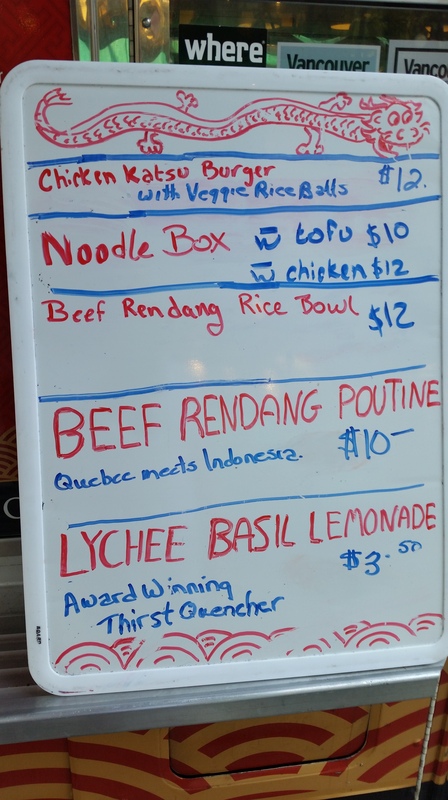 My eye was initially drawn to the Beef Rendang Poutine but my poutine experiences both at home and in Canada had been such a let down, despite the abundance of cheese and gravy they often provide, that I decided to play it relatively safe with a Chicken Noodle Box for CAD$12 (Approx. £6.75). I was instantly glad I opted for the Chicken over the tofu, not because I dislike tofu (I actually think well done tofu can be quite tasty), but because as I started revving the engine on my chopstick fingers it became apparent that the Tofu option would have been exactly the same except without the addition of chicken on top. First thing I noticed was that the portion was huge, I mean the picture probably doesn’t do justice to the depth of this box but it took me a good 15/20 minutes to eat it all. As well as the chicken the noodles were topped with chopped cashews and peanuts which added a lovely nuttiness that is so often attributed to South-East Asian cuisine. It was also garnished with fully sprouted bean sprouts, a pretty rare occurrence when Iv’e been out and about in the UK. These added a freshness and in the flavour stakes were certainly a ramped up version of the thin white bean sprouts commonly found at home with the leaves adding a slight peppery note. The chicken had been cooked separately and placed on top of the noodles bringing with it a slightly overbearing taste of white wine, initially fine but slowly building as I went. I know the flavour boost that a couple of dashes of shaoxing rice wine can bring to meat but this definitely focused more on the tartness of a white as opposed to the subtle hum of shaoxing or it’s commonly used western alternate sherry. There is no doubt that the noodles were very tasty heady with soy and flashing hints of ginger, garlic and five spice. The use of fine egg noodles was particularly pleasing for this guy as I think these are the best type to use when it comes to any kind of stir fry dish. The noodles were also dense with vegetables, a concoction of carrots, spring onions and highly-flavoured shitake mushrooms with little pockets of broccoli poking through every so often. The tofu had been stir-fried just long enough to give a crisp texture to a couple of the sides on each small cube whilst still remaining soft enough to eat. 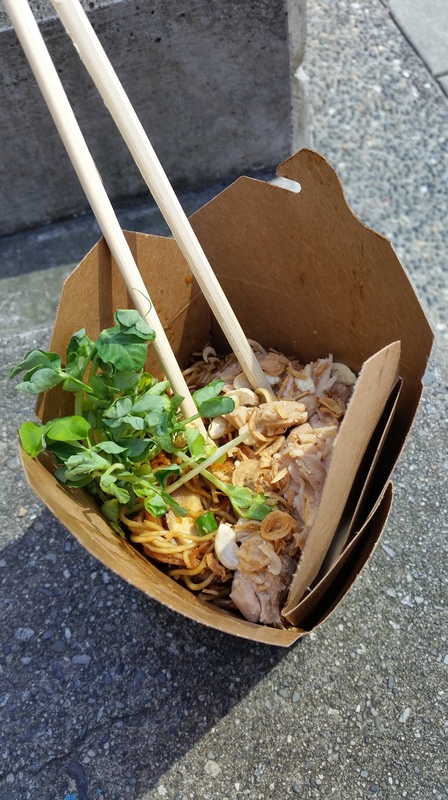 For me though the real skill in this food truck dish was the use of the chopped nuts and fresh bean sprouts adding another dimension to what was a very good, if not a bit safe, chicken noodle dish. If somebody was to offer me it again I wouldn’t turn my nose up at it, although at the same time I wouldn’t rush to ask for the same again. And so with that this wee adventure ends. Vancouver is a lovely city and if you are super energetic and have acquired a taste for artisan microbrews then there isn’t really anywhere else you should be looking to be. Until next time, Find a Van. Eat Some Scran! 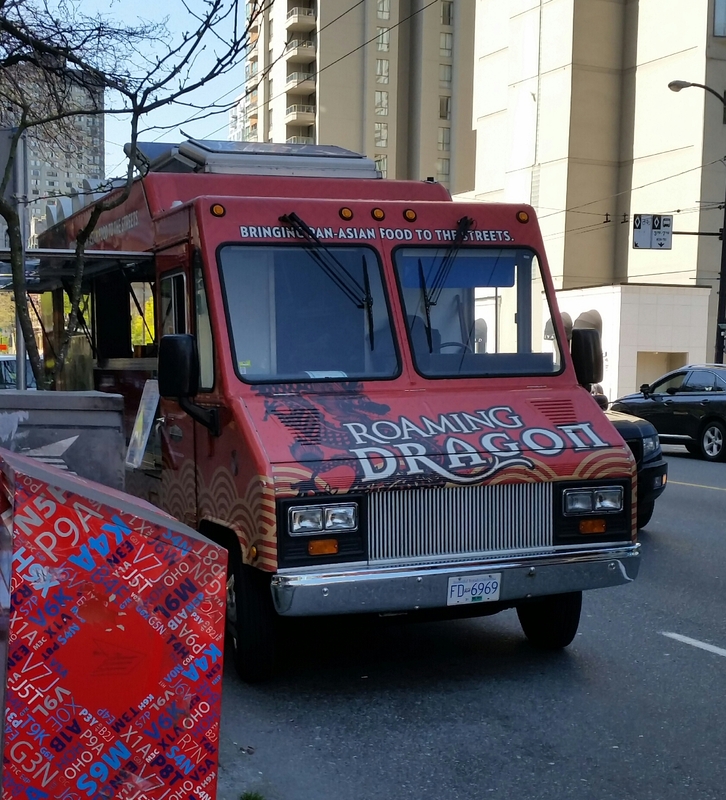 This entry was posted in VanCan ScranVan Reviews and tagged chicken, food, food truck, noodles, roaming dragon, scran, tofu, vancouver. After a couple of hours at the Rogers Arena watching a free-to-all Vancouver Canucks training session I had decided to embark on journey two of the VanCan ScranVan Diaries, there was a slight problem though. It was absolutely belting it down and I, being Scottish, was woefully under-prepared for bad weather on my holidays and as such the prospect of wandering the streets and getting a good drenching for my troubles wasn’t really revving my engine and it was at this point I remembered the stories I’d been told of Japadog. As the name, suggests, a Japanese themed hot dog truck that now had a fully enclosed shop somewhere in Downtown Vancouver, I could get the ScranVan experience whilst not running the risk of pneumonia. Where: Static location in Robson Street with other carts and vans available. On entering I was greeted with the kind of scene you would expect to be greeted with in the bustling market of east Asia. A wall splattered with brightly coloured descriptions of food all lit up and laminated whilst the accommodation consisted of a smattering of small tables, after assessing the situation I realised I was a bit phased by the menu. Would you like fish with your hot dog? The general theme seemed to be a hot dog of some variety topped with some kind of fishiness, whether that be seaweed or bonito flakes. One of the boards on the walls championed the ‘Kurobuta Terimayo’ as the their number one best seller and so never one to shirk a food related challenge I placed my order, making it a combo deal with a portion of sachimi & garlic ‘shaked’ fries and a bottle of water. Due to the mental way bills are calculated in Canada, where bits and bobs of tax are tacked on afterwards, my order cost a rounded down CAD$10.10, (£5.75). 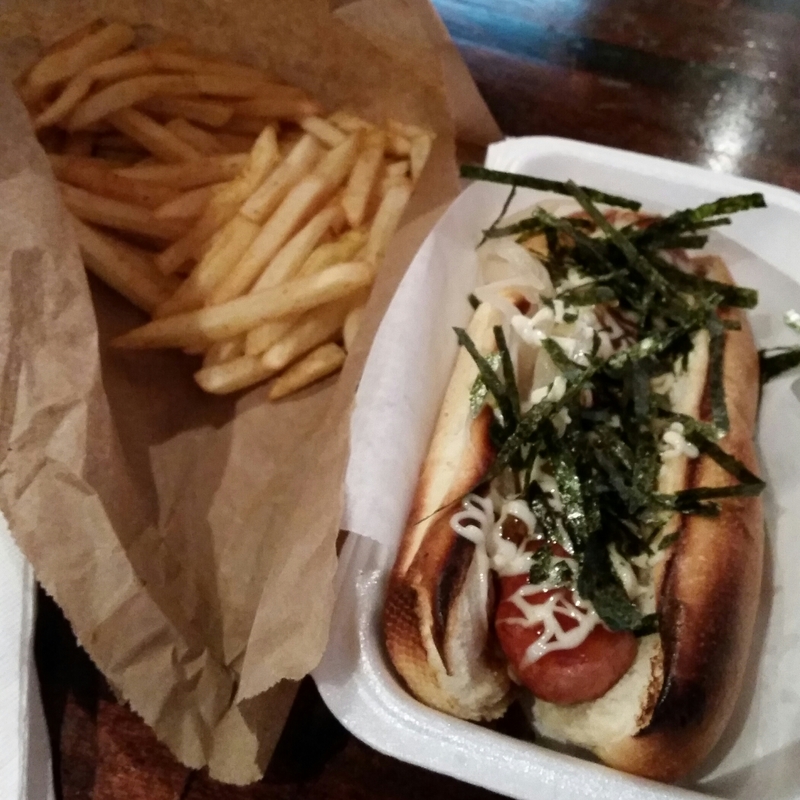 A Kurobuta Terimayo Hot Dog with teriyaki sauce, fried onions, terimayo and crispy seaweed with a side order of sachimi & garlic ‘shaked’ fries. The first thing I noticed was that it didn’t smell like a hot dog but more pungent of the sea thanks to with the shredded seaweed topping, it was pretty off-putting to be honest but never the less I took my first bite. Frankly it was all just a bit weird. Looking at the main event first let’s start with the positives, the dog itself was nice. It was billed as ‘Berkshire Pork’, but not really knowing what that is the closest comparison I can come with up is that of a Polish kielbasa, salty with a firm texture and an outer casing that popped when bitten for the first time. The bun was a little over toasted but was nice and soft without being stodgy but is at this point the positives end. The teriyaki sauce and terimayo were a strange combination, contrasting instead of complimenting each other. A good teriyaki sauce is a joy to behold but a bad one, oh boy, a bad one is like somebody has dispersed napalm onto your taste buds, this sauce was more napalm than joy and almost had a plasticky mass produced feel to it. The onions were fried but quite greasy and the seaweed apart from adding the smell of the coast added nothing to the overall taste. I ate it all but by the end I had decided I didn’t really like it. It wasn’t all bad though, the sachimi & garlic ‘shaked’ fries were fairly tasty. 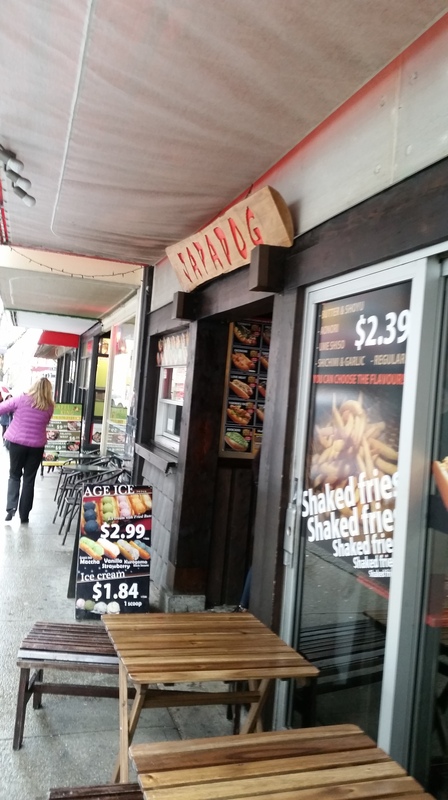 The ‘shaked’ name apparently linked to the method of preparation where a portion of skinny fries are thrown into a brown paper bag along with the requested spices upon which the cook closes the bag and gives it a good shake. They were pleasant but paled in comparison with some of the cajun fries that do the rounds in burger joints back in Glasgow. 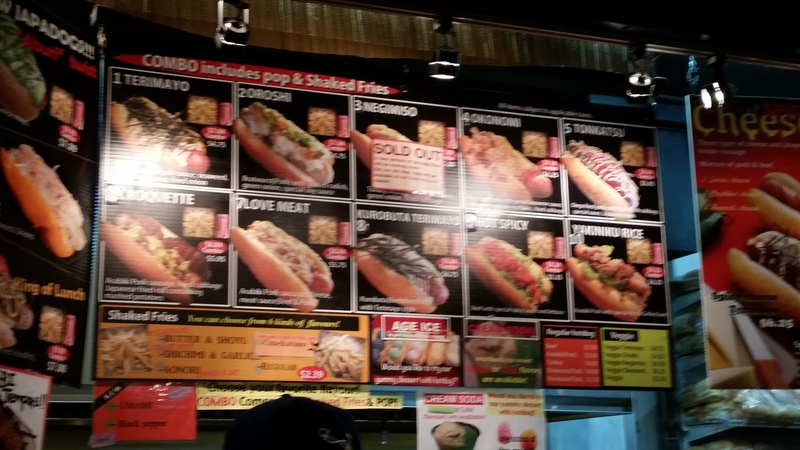 I left Japadog thinking that this was a gimmick that just didn’t work. I had been told stories of hour-long queues during the Vancouver Winter Olympics so there clearly is a cult following for the product but for me it was a disappointing take on the often glorious hot dog. If somebody ever asks, ‘Would you like your hot dog with or without an array of ill-fitting Asian ingredients?’, politely say ‘without’ and ask about the fries instead. This was my second disappointing ‘new’ food experience in a few days. I had spent the weekend in Whistler and had my first ever Caesar. 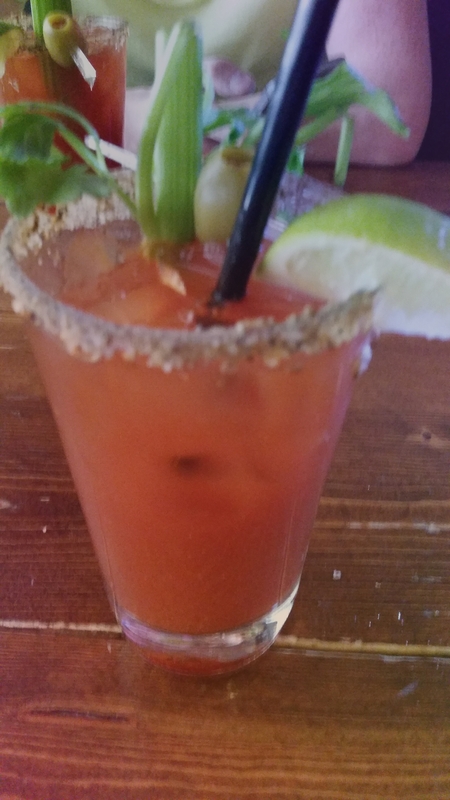 A drink made with Vodka, Celery, Celery Salt, Worcestershire Sauce, Tabasco, Lime and Clamato Juice which, as the name suggests, is a combination of clam and tomato juices. 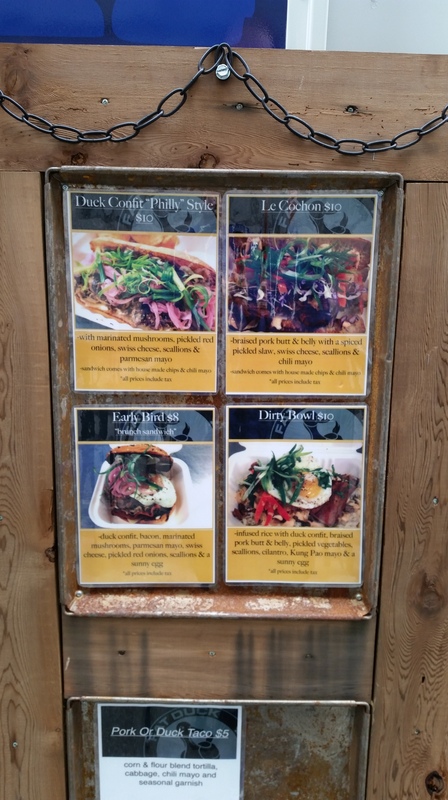 This entry was posted in But That's Not a Pie!, VanCan ScranVan Reviews and tagged Caesar, food, food truck, food van, fries, garlic, hot dog, japadog, sachimi, teriyaki, van, vancouver. The VanCan ScranVan Diaries: The Fat Duck Mobile Eatery Ltd.
As I mentioned in my last entry I’m currently spending some good times with friends in Vancouver and as such my life of pie has taken a slight detour while I recharge my batteries and figure out exactly where I want my life to go next but I’m not going to bore you with that…instead I’m going to bore you entertain you with my tales of the best that Vancouver’s Food Trucks have to offer. The idea to do this was actually floated to me by my host a couple of months ago, advising me that native Vancouverites (Is that right?) pride themselves on their culinary diversity and quality and that the food truck scene is something not to be missed. At the time I hadn’t really given it much thought, in fact it wasn’t really until last night that the conversation cropped up again but as I woke up this morning with no real clear plan it dawned on me to download the ‘Street Food Vancouver’ app and have a proper look. Imagine then my joy as 27 locations popped up open for business. The die had been cast and I would grab some lunch and then see where the day would take me. Before I get started as followers of Meat Filled Pastries will tell you it is usually at this juncture that I will roll out the tried and trusted phrase of, “Without much further ado, let’s rate some pie!”, however since pies are not necessarily the order of the day it would be remiss of me not to pull another literary gem out of the bag. Where: Corner of W Cordova St. & Howe St. 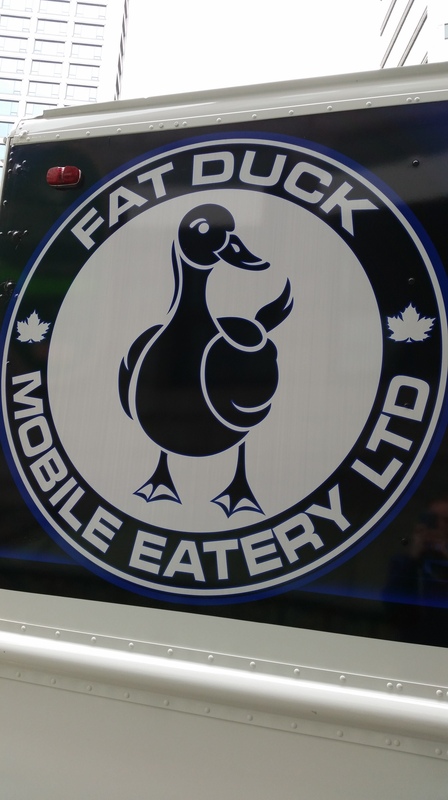 The Fat Duck Mobile Eatery Ltd. I had decided to head to the Downtown district of Vancouver for my first food truck foray, partly on the recommendation of my hosts but also because that was where all the arrows were pointing me too on the app. Initially I was going to start my journey blind heading towards which ever venue appeared first but knowing my mass indecision when it comes to food (I will pretty much try anything once), I thought it would be better to put a bit of planning into this maiden voyage and so the decision to visit the Fat Duck Mobile Eatery Ltd. was made helped by the fact that on hitting a click-through on the app a menu was provided. My eye was immediately drawn to the Duck Confit ‘Philly’ Style. A rift, I assumed, on the classic Philly Cheese Steak. At CAD$10 (Approx. £5.50) it looked an absolute bargain and so I placed my order ignoring the tempting allure of something called a ‘Dirty Bowl’ whilst also trying not to giggle like a school girl while the young fellow in front of me asked if the woman behind the counter’s Dirty Bowl was spicy. I’m such a child! As part of the ordering process I had to make up a name for myself as over the last few days it has become apparent that the Canadian ear seems to struggle with somebody saying ‘Chris’ in a strong Glaswegian accent and so ‘Marshall’ (These may get more intricate as the week goes on) awaited his order. When it arrived in its large boxed container it smelt amazing and on opening I wasn’t disappointed. The saliva glands were working overtime and I walked away looking for a place to devour my scran. My initial thought was to stroll along to Canada Place, a long pier just off the city centre, however as soon as I sat down a seagull the size of a Shetland Pony promptly sat itself down beside me and so I relocated to a less coastal location in the hope of eating my lunch in peace. As I hope the picture shows this was bursting to the crusts with meat and veggie goodness, served on a ciabatta bun I was concerned that any bite I took would end in disaster due to the occasionally chewy nature of this bread but luckily my bite was masterful as always and a couple of chews later and the party had started! The first thing that struck me was how well the duck had been confit and the fact that there was very little fat amongst the meat, it was seasoned well and was speckled with lovely dark crispy bits throughout that added a deeper duck flavour. Next up on the palate was the wonderfully sweet and tangy pickled onions, using red instead of standard white onions should be considered a masterstroke as the sweetness complimented the duck superbly and the fresh scallions added a bit of additional crunch and a fresh, but light, onion back note to the sandwich. The marinated mushrooms added extra bite and pleasingly tasted of mushrooms. That may sound daft but an overcooked mushroom is a travesty to food, my only problem here is that as I write this a few hours later I am unable to pinpoint the marinade used. The final part of this sandwich, and perhaps the most interesting to me, was the addition of the Swiss cheese and parmesan mayo. My natural instinct was to dismiss duck and cheese as a combination too far but I was sorely mistaken. The mild Swiss cheese melded really well with the tender pulled apart duck just melting and adding a smothness to the rich meat whilst the parmesan mayo added a salty seasoning to the entire thing that I really enjoyed. The crisps were nicely baked and seasoned whilst the chilli mayo was a pleasant accompaniment, smoky with a mild heat but the sandwich was clearly the star of the show, if everything from a Vancouver Food Truck tastes as good as this you’re going to have a very happy pie man. I’d love to get some feedback on this, much like the first ever pie review this was an idea after the event so there will be some things getting changed for next time anyway. Although this is slightly outside my comfort zone in terms of writing it’s something I’ve always wanted to give a bash so we’ll see how it goes, until next time…. 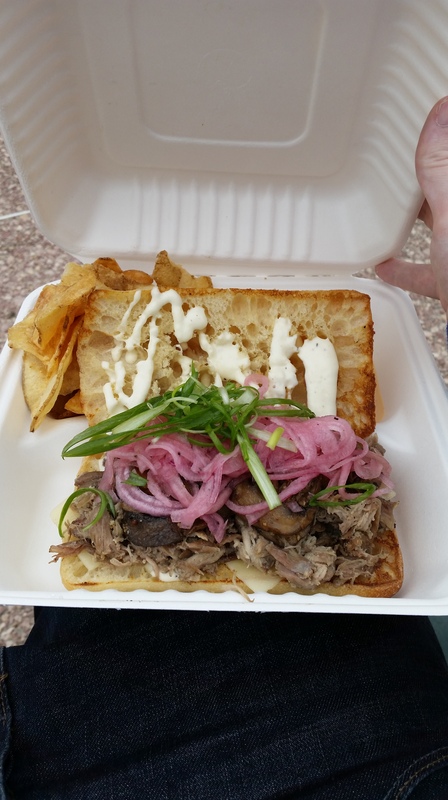 This entry was posted in But That's Not a Pie!, VanCan ScranVan Reviews and tagged ciabatta, confit, duck, food, food truck, meat filled pastries, scran, the fat duck mobile eatery ltd, van, vancouver.